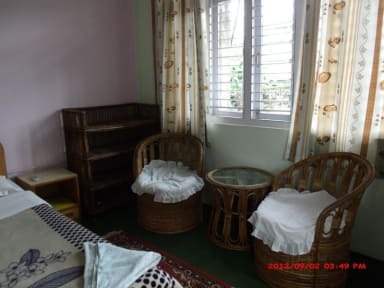 If you're looking for a great place to stay in Pokhara, stop looking and book. It's a small, family-run business which is fantastic in all areas. Rooms are a good size - ours was a double room - with 2 chairs and a small tables, shelves and a small TV. Bathroom is clean and functional. Location is fabulous. It's about 4 doors up 15th street from the main road, where all the action in Pokhara is. Raj and his family are wonderful and will help with whatever bookings or advice you need. Brilliant. I had a wonderful stay and hope to return soon!! Clean room, great location, and the most friendly and helpful owner you could ask for. Great place. Really nice family atmosphere. We had a great stay at Pushpa Guest House. 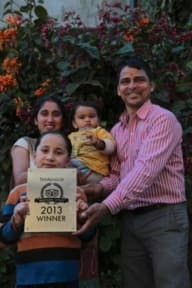 Raj and his family were so welcoming and friendly and helped us out with the organisation of our trips. We were able to leave our lug gauge securely at the guest house whilst doing the Annapurna Trek and going mountain biking. The location at Lakeside was perfect for exploring Pokhara and we will definitely stay again next time! Raj and his family are great! So kind and friendly. Raj is always ready to help! We stayed 3 night before our trek and 5 night after it. Location is perfect, room is nice and clean and wifi worked perfectly. I can Highly recommend this place! And if you need any help with trekking, bus tickets or any activities, ask Raj, he will help you gladly. If we come back to Pokhara some day, we are staying in pushpa guest house again! The manager was really friendly and made us feel extremely welcome. He was also enthusiastic about helping us find taxis at a good price. Would definitively recommend to anyone looking for a lovely room in Lakeside! Raj the owner was very friendly and helpful. He did his best to organize a tour for us which fits for all members of our group. The guide we got was very nice and everything worked out well, we had a great trip in the mountain area. The hotel is nice and invites to relax also after trekking. Location is great and value for money is very good. Would definitely stay here again and recommend Raj and his family as hosts for everyone. Thank you and all the best. The owner is very nice, helpful and accommodating. The deluxe double was a nice room that me and my friend enjoyed. The location is perfect, everything is within walking distance. This is a good place to come with a friend because it is not a very social hostel. Thanks! Lovely big room in an ideal location. Host was very friendly and helpful. WiFi a little weak and the shower did not work but I did not report this as I was in a rush and I’m sure the host would’ve been very helpful if I had reported it. Would definitely stay again. The staff were really friendly and helpful. The guest house is centrally located. It offers good value for money. Security was good .... so good The only problem I had was that I found the bed too hard. It was like sleeping on rocks. I suppose if you’re a trekker used to sleeping in tents. It’s probably fine .... I’m not .... I only stayed one night out of the 3 I’d booked and booked into the hotel next door. Which (if you can afford it .... about 3 times the price) ... was great.